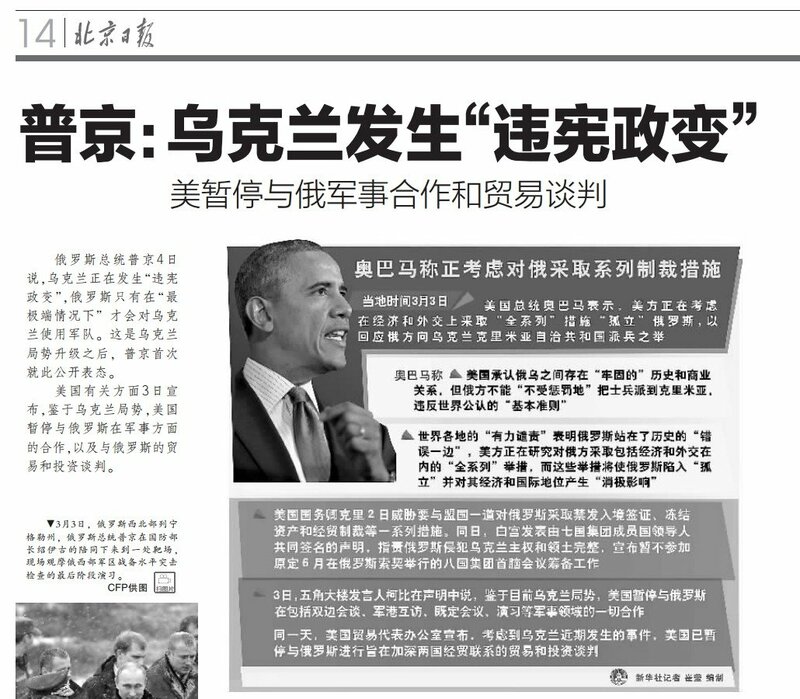 That’s the headline from a Beijing newspaper– and no surprise that it leans slightly to the Russian side. Mr. Putin added that Russia is still preparing for upcoming G8 meeting. “If [the other countries] do not want to come, they don’t have to,” he told reporters . “Our partners, especially in the U.S.– they always clearly formulate their geopolitical interests and pursue them very aggressively. Guided by the well-known phrase, “you are either with us or against us,” they drag the rest of the world along, underneath them. And whoever doesn’t go along is beaten and usually killed,” the President told reporters. He emphasized that Russia’s actions come from legitimate grounds.So on one hand, the Chinese are essentially making the West out to be the belligerents, the Russians to be defending their interests, and the Chinese as the strong diplomats who are pushing for peace. And on the other hand, the Russian papers are highlighting the utter hypocrisy of US foreign policy– it’s OK for America to invade whatever country it likes, but not for Russia to defend its own interests.